There are many default receipt templates included with the Evergreen staff client. These templates are saved on invidual workstations. Customization can be done workstation by workstation or by exporting the templates to import to other workstations. Select the checkout template from the dropdown menu. This is what the default checkout template looks like. The template preview is on the left hand side. You can edit the Header, Line Item or Footer on the right hand side. In the upper right hand corner you can see the available macros by clicking on the Macros button. A macro prints a real value from the database. 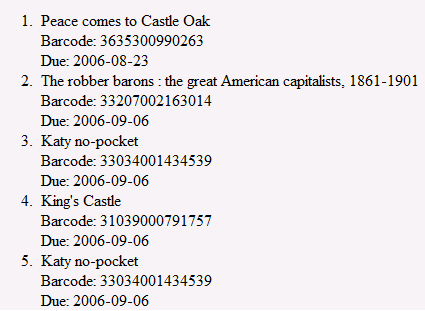 In this example, the macro %LIBRARY% prints “Prince Rupert Library”. The macros that are available vary slightly between types of receipt templates (i.e. bills, holds, items). Receipt templates are marked up with HTML tags. You may use most HTML tags. See http://www.w3schools.com/html/ for more information on HTML tags. You may insert a link to an image, e.g. your library’s logo, that exists on the web. For example, to inlcude the white Evergreen logo from this document, enter tag <img src=http://docs.evergreen-ils.org/2.3/media/small_logo_white.jpg>. in the receipt template. The due date can only be printed in the YYYY-MM-DD format. Once you have the checkout template how you want it, click Save Locally to save the template to your computer. As you can only save a template on to the computer you are working on you will need to export the template if you have more than one computer that prints out receipts (e.g. more than one computers on the circulation desk, or another computer in the workroom that you use to checkin items or capture holds with). Send the exported templates file to the workstation to which you want to import the templates. You may do it using memory stick or email, etc. 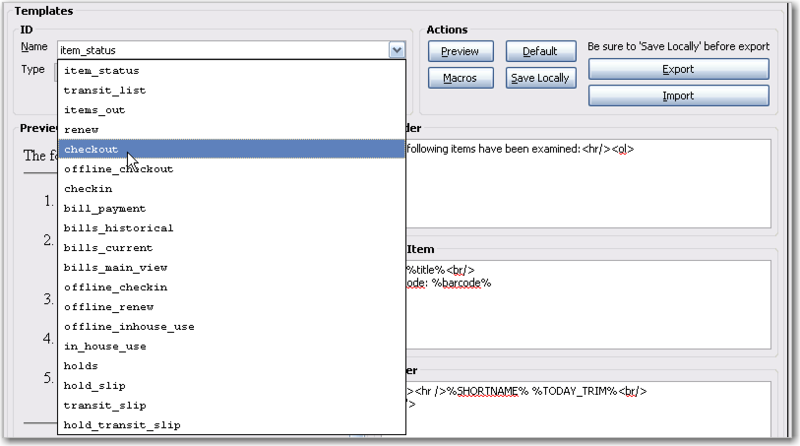 On Receipt Template Editor, Click Import. Navigate to and select the template file that you want to import. Click Open. Click OK to confirm on the prompt. 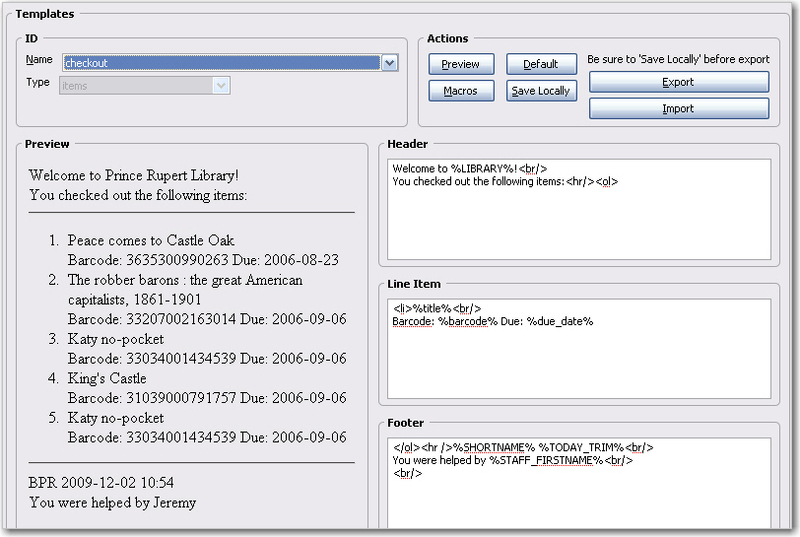 By default all libraries use shared and hard-coded templates for Hold Slip and Transit Slip. Libraries can switch to using their own templates by setting up a library setting: Use legacy hardcoded receipts/slips. Details see Library Settings.